A beautiful Mozart Benedictus. The lyrics: "Blessed is he who comes in the name of the Lord" (Benedictus qui venit in nomine Domini). 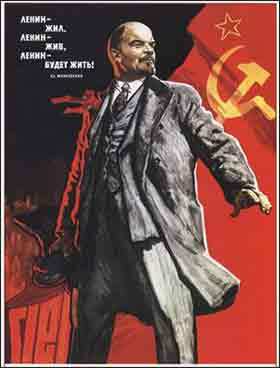 Vladimir Lenin, the first god of the "atheist" USSR. The lesson we must learn, my brothers, is at all costs to avoid worshipping a false god. I am speaking to you as intelligent men: think over what I am saying. The cup of blessing which we bless, is it not a very sharing in the blood of Christ? When we break the bread do we not actually share in the body of Christ? The very fact that we all share one bread makes us all one body. Look at the Jews of our own day. Isn’t there a fellowship between all those who eat the altar sacrifices? Now am I implying that a false god really exists, or that sacrifices made to any god have some value? No, I am not. I say emphatically that Gentile sacrifices are made to evil powers and not to God at all. I don’t want you to have any fellowship with such powers. You cannot drink both the cup of the Lord and the cup of devils. You cannot be a guest at the Lord’s table and at the table of devils. Are we trying to arouse the wrath of God? Have we forgotten how completely we are in his hands? The Bible does not really treat the concept of atheism, the simple absence of belief in a god or gods. The theological disctinctions are primarily between believers in God and idolators (with Jews who will not accept Christ added in the New Testament). In the first several centuries A.D., literal idolatry was still the prevalent religious practice. In the Roman Empire, where most of early Christianity took root, the gods were literal idols, whether marble statues in magnificent temples or little mud figurines in humble huts. Paul must thus treat with idolatry; earlier, he gave advice on eating food that had been sacrificed to a god or goddess in a pagan ritual. Here, he deals with a frequent difficulty faced by missionaries over the ages: People who worship a false god or gods will simply add Christ as a main god in their pantheon. Idolatry is a primary sin, the root of evil; the First Commandment comes first because it is the most important. Paul here tells us that we much avoid it "at all costs". When we ascribe unnatural meaning or power to a person or inanimate object, it gets in the way of our love for God and obfuscates the only path to true salvation. Atheists, who swear they believe in nothing but "reality", are actually practitioners of the lesser form of idolatry. Without exception, they are trying to find meaning and salvation in a person, object, or even an intangible; and also without exception, the object of their worship fails them. The Bible does not mention atheism because it is actually a rare and temporary state. Very discouraged or depressed people may simply stop living, and become actual atheists for a period. But nearly all self-described "atheists", who will tell you that they do not believe in any god, are idolaters, not actual atheists, for they hold in their heart the hope of salvation through something or someone who will, eventually, fail them.